All good dogs come to an end. Mum’s beloved dog, Tippy, was no exception. A time came when Tippy’s back legs gave out, and she could no longer dash across the front porch to her favorite piddling place beneath our giant blue spruce. Her solution to Tippy’s problem was to seize her rear legs like the handles of a wheelbarrow, and wheel her out to the blue spruce. There, she shifted Tippy’s rear legs forward, and her bottom downward, into an approximation of the squatting position. With encouraging noises, like the ones she once used to persuade her children to Go Potty, she induced Tippy to perform. 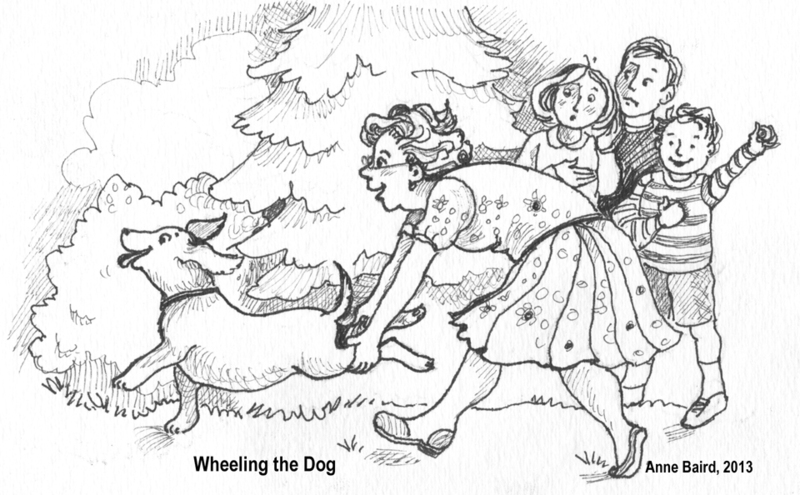 After that, as a reward for good behavior, she wheeled the little dog around the circular driveway, and out into the garden, so she could sniff around, and check out any unauthorized markings on the lawn or bushes. Able-legged neighborhood dogs, emboldened by Tippy’s disability, had taken to invading her territory. Tippy covered every one of these sneaky markings with dribbles of her own, to her and Mum’s great satisfaction. If I shut my eyes, I can see Mum, leaning into the curve of the driveway as she steered a small crippled dog into the garden they both loved. Wheeling the dog! It was another lesson in love and faithfulness to our fellow creatures that I owe to my mother. One day, Tippy didn’t wake up for her morning walk-about. True to her quiet, unassuming nature, she slipped away with no fuss or bother. She had lived her life to its natural conclusion, and died, a happy dog. Mum never got another pet. I think that Tippy took with her a piece of my mother’s heart that she simply couldn’t replace. © 2018, Little Big Books. All Rights Reserved.